Western blot analysis of extracts from various cell lines using JMJD2B (D7E6) Rabbit mAb. 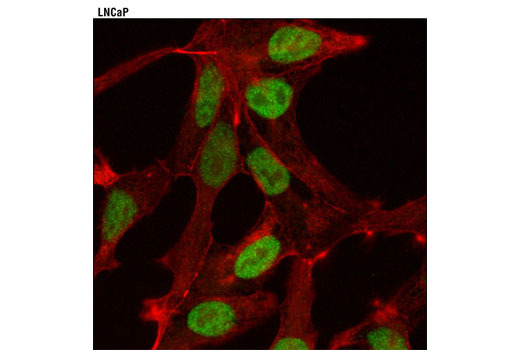 Confocal immunofluorescent analysis of LNCaP cells using JMJD2B (D7E6) Rabbit mAb (green). Actin filaments were labeled with DY-554 phalloidin (red). JMJD2B (D7E6) Rabbit mAb recognizes endogenous levels of total JMJD2B protein. 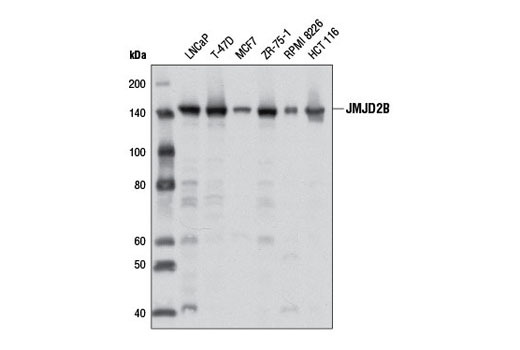 This antibody does not cross-react with other Jumonji C proteins, including JMJD2A, JMJD2C, and JMJD2D. Monoclonal antibody is produced by immunizing animals with a synthetic peptide corresponding to residues near the carboxy terminus of human JMJD2B protein. The methylation state of lysine residues in histone proteins is a major determinant of the formation of active and inactive regions of the genome and is crucial for proper programming of the genome during development (1,2). Jumonji C (JmjC) domain-containing proteins represent the largest class of potential histone demethylase proteins (3). The JmjC domain can catalyze the demethylation of mono-, di-, and tri-methyl lysine residues via an oxidative reaction that requires iron and α-ketoglutarate (3). Based on homology, both humans and mice contain at least 30 such proteins, which can be divided into 7 separate families (3). The jumonji domain-containing protein 2 (JMJD2) family, also known as the JmjC domain-containing histone demethylation protein 3 (JHDM3) family, contains four members: JMJD2A/JHDM3A, JMJD2B/JHDM3B, JMJD2C/JHDM3C, and JMJD2D/JHDM3D. In addition to the JmjC domain, these proteins also contain JmjN, PHD, and tudor domains, the latter of which has been shown to bind to methylated histone H3 at Lys4 and Lys9, and methylated histone H4 at Lys20 (4,5). JMJD2 proteins have been shown to demethylate di- and tri-methyl histone H3 at Lys9 and Lys36 and function as both activators and repressors of transcription (6-11). JMJD2A, JMJD2C, and JMJD2D function as coactivators of the androgen receptor in prostate tumor cells (7). In contrast, JMJD2A also associates with Rb and NCoR corepressor complexes and is necessary for transcriptional repression of target genes (8,9). JMJD2B antagonizes histone H3 Lys9 tri-methylation at pericentric heterochromatin (10). JMJD2C, also known as GASC1, is amplified in squamous cell carcinomas and metastatic lung carcinoma and inhibition of JMJD2C expression decreases cell proliferation (11,12). JMJD2C has also been identified as a downstream target of Oct-4 and is critical for the regulation of self-renewal in embryonic stem cells (13). Recent studies have demonstrated that JMJD2B is physically associated with and an integral component of the mixed-lineage leukemia (MLL) 2 H3K4 methyltransferase complex. JMJD2B also interacts with estrogen receptor α (ERα) and members of a chromatin remodeling complex, SWI/SNF-B. It is likely that JMJD2B removes repressive histone marks at ERα binding sites, which may also generate docking sites for enzymes and transcription factors that remodel chromatin in order to facilitate ERα-mediated transcription. Of note, JMJD2B is expressed in a high percentage of human breast tumors and its expression positively correlates with ERα expression. Researchers have shown that JMJD2B is a transcriptional target of ERα and may participate in a feed-forward regulatory loop involved in driving estrogen responsive breast tumor formation (14,15). Klose, R.J. et al. (2006) Nat Rev Genet 7, 715-27. Chen, Z. et al. (2007) Proc Natl Acad Sci U S A 104, 10818-23. Lee, J. et al. (2008) Nat Struct Mol Biol 15, 109-11. Whetstine, J.R. et al. (2006) Cell 125, 467-81. Shin, S. and Janknecht, R. (2007) Biochem Biophys Res Commun 359, 742-6. Gray, S.G. et al. (2005) J Biol Chem 280, 28507-18. Zhang, D. et al. (2005) Mol Cell Biol 25, 6404-14. Fodor, B.D. et al. (2006) Genes Dev 20, 1557-62. Cloos, P.A. et al. (2006) Nature 442, 307-11. Italiano, A. et al. (2006) Cancer Genet Cytogenet 167, 122-30. Loh, Y.H. et al. (2007) Genes Dev 21, 2545-57. Shi, L. et al. (2011) Proc Natl Acad Sci USA 108, 7541-6. Kawazu, M. et al. (2011) PLoS One 6, e17830.